Over 50 expert speakers will offer insights into new suppliers, emerging markets, and changing trade flows shaping the tissue sector. This year’s Tissue World Conference in Milan will focus on the rapid developments in geopolitics, megatrends, circular economy, product innovation, and digitalisation shaping the global tissue trade. The European tissue volume peaked at 8.5m tonnes in 2017 and is set to grow by 3.5% per annum for the next 10 years. The three-day conference and exhibition – held at Fieramilanocity, Hall 3, Milan, Italy, from 25 to 27 March – will kick off with the Senior Management Symposium gathering senior management, technical experts and operations professionals. With the theme of ‘Smart and Sustainable – Strategies to Stay Sharp as a New Decade Dawns’, it will explore the key opportunities and challenges facing an increasingly dynamic tissue business and hear from some influential speakers. At the symposium, Magnus Groth, President and Chief Executive of Essity, will deliver the keynote address ‘Creating today a sustainable business for tomorrow’ and discuss the role of digitalisation in the tissue industry. In his outlook on the world’s tissue market, RISI’s Principal Esko Uutela will focus on Europe and elaborate that while China continues to be the main driver for global growth, North America and other developed markets have shown strong developments recently, and global tissue demand is expected to reach 53m tonnes by 2027. European Tissue Symposium (ETS) Chairman Fanis Papakostas will speak on the hygienic advantages of tissue paper. His presentation – ‘Hand drying is a serious business’ – draws on the findings of a new scientific study carried out in real world settings in France, Italy and the UK, and examining the extent of environmental contamination in hospital washrooms from potential bacterial pathogens by hand drying method. Another notable speaker is Tomi Amberla, Principal of Pöyry Management Consulting, Finland, who will address delegates on ‘Is the global pulp shortage going to continue?’ Pulp currently represents around 70% of manufacturing costs of virgin tissue jumbo reel, and some 50% of the converted product costs. Amberla will provide insights into the outlook for 2019, and the impact this will have on the market. On Tuesday and Wednesday, 26 and 27 March, the conference sessions will comprise a Yankee Safety & Reliability Workshop and Technical Sessions exploring new technologies and developments. Commenting on the event, Conference Chair Jonathan Roberts said: “Our industry is at a crossroads in many ways. “The dawning of a new decade brings challenges around the sustainability of our entire business model – including how we transact with consumers and how we communicate and trade around the world. “With so much at stake, the need to create dialogue and hear the reactions and opinions of delegates will be essential to the success of Tissue World Milan. 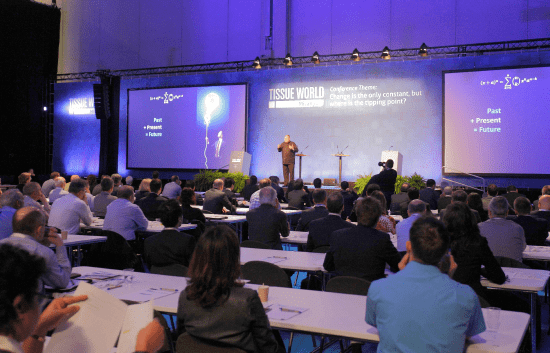 Tissue World is the largest trade fair and conference specifically dedicated to the tissue business, and is the go-to destination for all those involved in the tissue paper products supply chain. More than 50 speakers will share their knowledge over the three days, including academics from leading universities, chief executives of industry players, research companies, sustainability experts, and leading paper and tissue industry bodies. For detailed information on all sessions and speakers, see the agenda here www.tissueworld.com/milan. For more info, visit www.tissueworld.com. Share the post "Tissue World Milan 2019 Conference to focus on global megatrends driving the industry"